For many people, working with a laptop is just a regular part of daily life. When you need a portable workstation, having some kind of notebook to help you along might be essential. Which can make the right Thunderbolt 3 dock totally invaluable. Especially if you’re bringing mobile devices into a workplace. 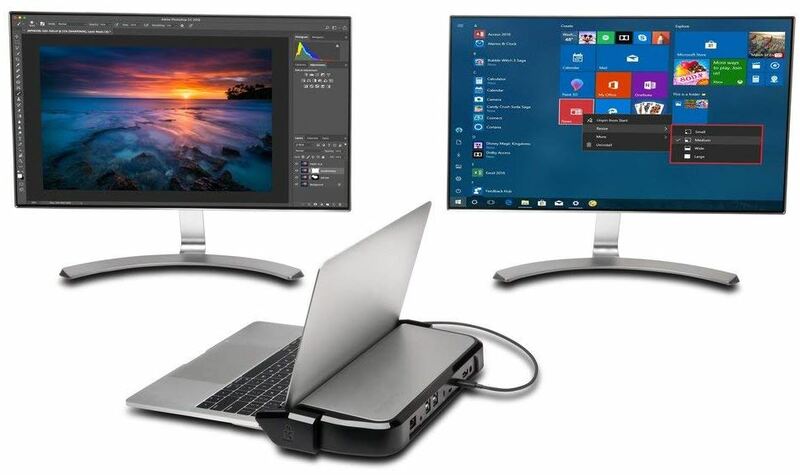 Whether you’re worried about the safety and security of your stuff, or you’re only concerned about being able to expand your PC with a couple of video connections, the right mobile docking station can be every bit as important as having the right PC. Yet picking a docking station can be tricky. 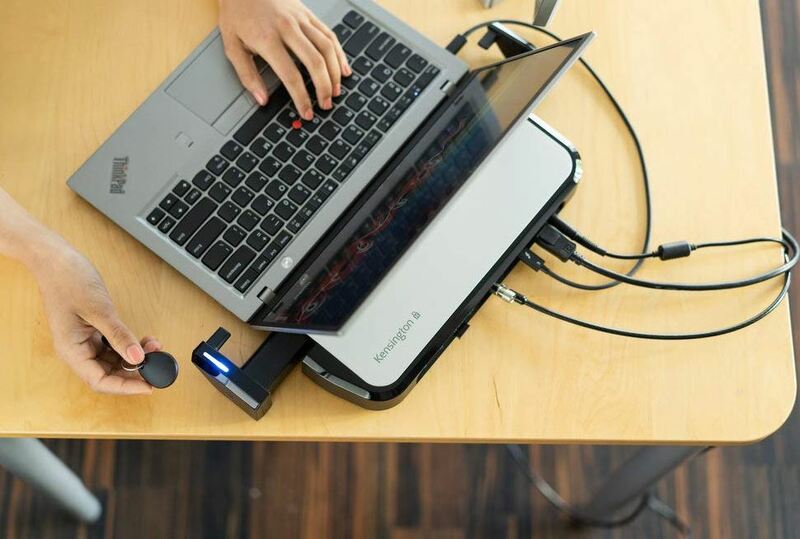 One of the reason why so many brands make a docking station specific to one set of products, like a MacBook station, is because it can help streamline the otherwise complicated task of making an effective station. When you’re making a docking station intended to accommodate a wide variety of different electronics, the design challenge is enormously different. Which brings us to the Kensington LD5400T. 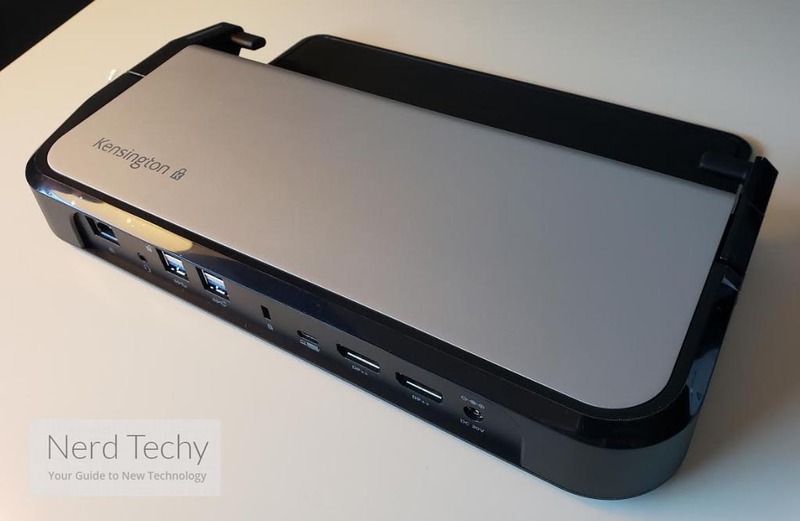 Like a lot of different docking stations, it provides an array of different inputs, including video, audio, internet connectivity, and others. But unlike many similar stations, the LD54000T isn’t married into the ecosystem of a single brand. It works equally well for Apple devices, Samsung devices, and even random tablets you pick up from generic brands. The only real limits it imposes on you have to do with the physical form factor of your devices. In other words, your stuff can’t be too big, which is something you should be able to work out just by looking at the device. While still managing to offer a number of modern next-generation technologies, the LD5400T was made with a pretty intuitive physical design. Once all is said and done, the LD5400T is supposed to deliver a best in class docking experience. Does it get there? Well, it depends on how well your needs match with its capabilities to begin with. 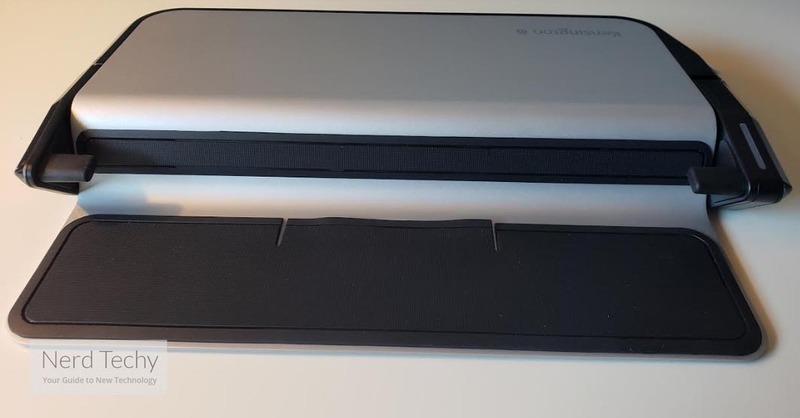 But most people, especially those who don’t use giant laptop screens, ought to be able to find at least a couple of things to like about the LD5400T Thunderbolt 3 Universal Dock. From a physical standpoint, this docking station is fairly compact. It measures roughly 3.2 x 14.1 x 12.4 inches, not much larger than a small printer. It actually weighs pretty similar to a small printer as well, with the total weight coming in around 7lbs. Not very difficult to find a good place to position it. Though because this dock is expected to interact with mobile electronics, it wasn’t made with any significant mounting options. It’s really intended to sit stationary on a table, desk, countertop, or something similar. 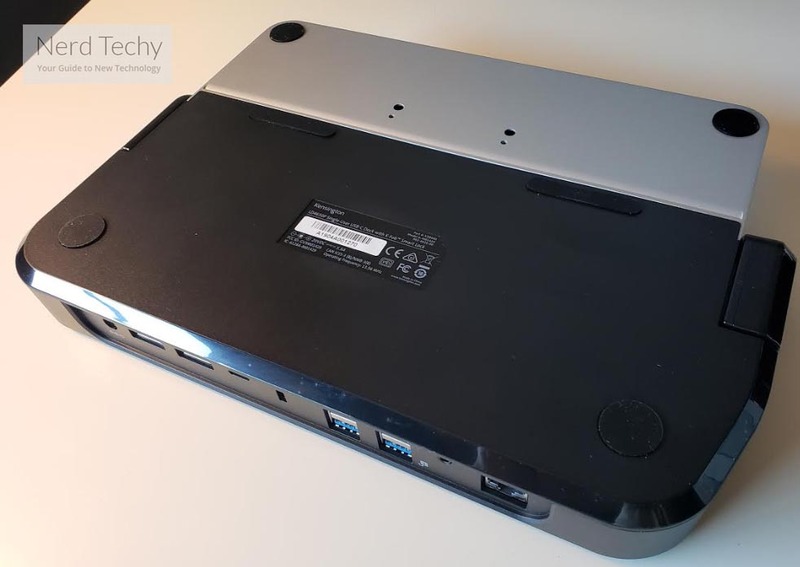 It may also be worth noting the chassis was constructed with a number of scratch resistant bumpers to help protect the sides and base if your laptop against minor cosmetic damage. From a superficial point of view, the black and silver chassis is a little generic looking, though that’s reflective of the entire Kensington brand. They seem to place professionalism ahead of style in basically every circumstances. And it’s something you become willing to forgive once you get a general sense for the underlying quality of these parts. If you look on the side of the unit, you’ll find that you can lock laptops with the 11” to 15” adjustable security arms. Not only are these arms effective at holding your stuff in position, they were also smartly positioned. 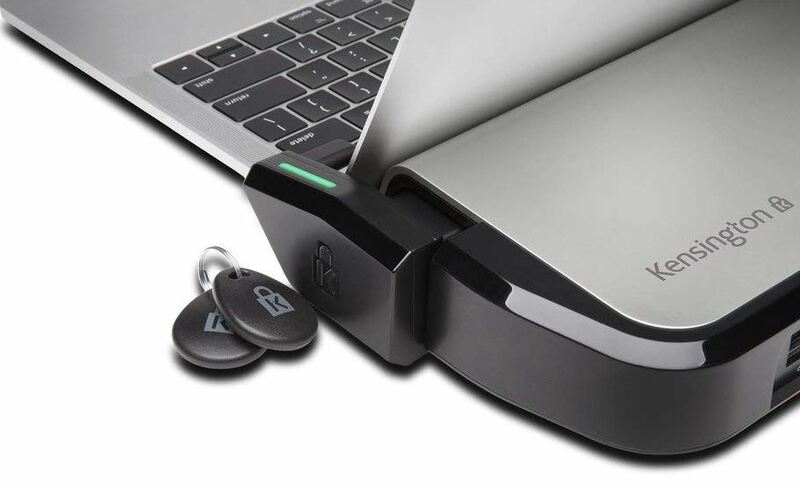 Their positioning allowing you to keep unobstructed access to the I/O along the side of your laptop while it’s connected to the LD5400T. As a result, you don’t have to make any modifications to your machine in order to start using this docking station. Are you one of the countless people who use a wireless mouse with your laptop, connected with a USB dongle? That little dongle won’t get in the way of operation thanks to the positioning of the arms. Typically, you can only get Thunderbolt 3 support from right off a motherboard. Few exceptions exist, docking stations like the LD5400T are one of those exceptions. And this station brings everything Thunderbolt 3 has to offer to the table, especially in the realm of UHD support. Because Thunderbolt 3 allows you to transfer data at speeds of about 40Gbps. That’s enough bandwidth to move a 4K movie in about half of a minute. It’s also enough bandwidth to support a pair of 4K UHD displays, which this station can do. It can effortlessly support a pair of 4K ultra HD displays on two separate monitors at the same time while running at 60Hz. No small feat. But what about people who are using ultrawide screens? Well, the LD5400T is capable of being used to support a 5K resolution at 60FPS for a single screen. Whether you’re running a monster-sized display or you’re using several screens, you’ve got options with this dock, and none of them require you to dip below 60Hz. The LD5400T provides a pair of separate Thunderbolt 3 ports, one DisplayPort, and four USB 3.1 ports. Those USB ports are actually super-speed ports operating on the USB 3.1 standard, though the amperage of each port is only 5V/0.9A. That means they’re not ideal for recharging your stuff at the fastest available speeds, but they can still get the job done. 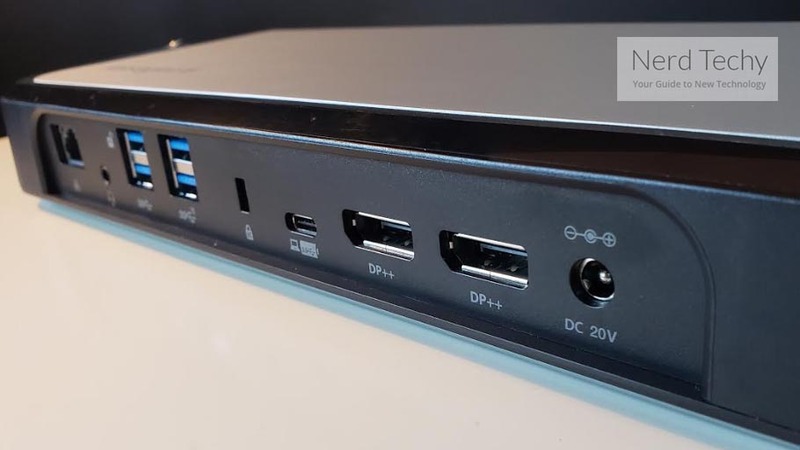 Like basically any similar docking station, the Kensington LD5400T also provides a gigabit Ethernet port, which is useful for running a signal through your network of displays. Somewhat less like other stations, you’ll find a headphone jack, which serves an input and output jack. Quite handy given the fact this station wasn’t really intended to be hidden away somewhere. Unsurprisingly, there’s also a USB-C port. That port can deliver 85W of power, which is enough to power up most laptops. 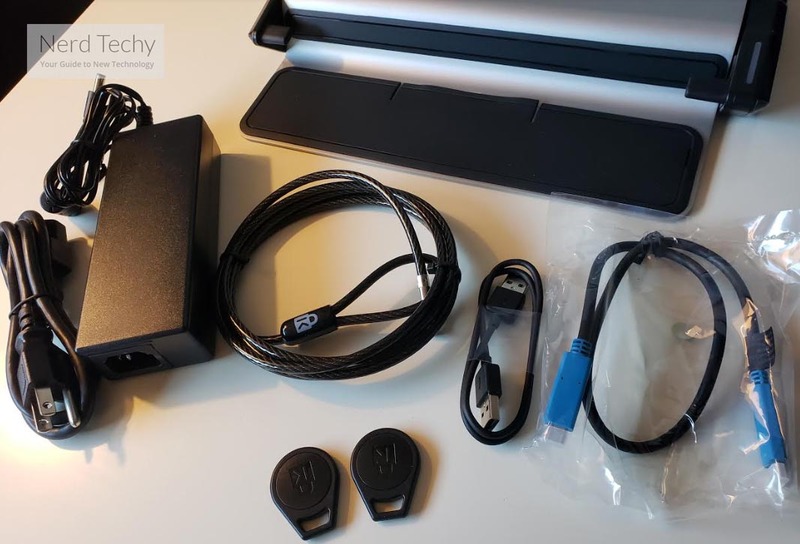 It’s only when you start to get up towards giant 17” laptops, or gaming laptops with enormously powerful hardware, that you’ll encounter potential power issues from this port. And 85W is high enough that those power issues will only become apparent when you actually push your machine during operation. Meaning you’ll still be able to use those larger laptops in a number of different circumstances, you just won’t be able to load up a graphically intensive game. If nothing else, Kensington knows a few things about security. Here you’ll find the LD5400T actually provides you with three separate locking mechanisms to help secure your stuff. The first mechanism provides the ability to tether the docking station against any fixed structure, along with the help of an included cable lock. Very handy for keeping the station itself in position. The second mechanism allows you can use a Kensington lock slot, along with the aid of a separate cable lock, which isn’t included, to secure your devices to the station. For someone who need to move their machine around, away from the docking station and its locking arms, this optional mechanism provides a lot of different options. The third mechanism allows you to attach the dock to a desk with the aid of two screws. That’s possible with the aid of pre-drilled mounting holes positioned along the bottom of the dock. It’s great for permanent or semi-permanent installations. But permanent installations aside, when you need to start attaching or detaching stuff from the docking station, it’s easy to be impressed with how smooth things are. The K-Fob smart lock technology works to combine digital and analogue security into a single mechanism, enabling a keyless locking mechanism to help protect your stuff. Basically, that means you don’t have to fumble around with keys. 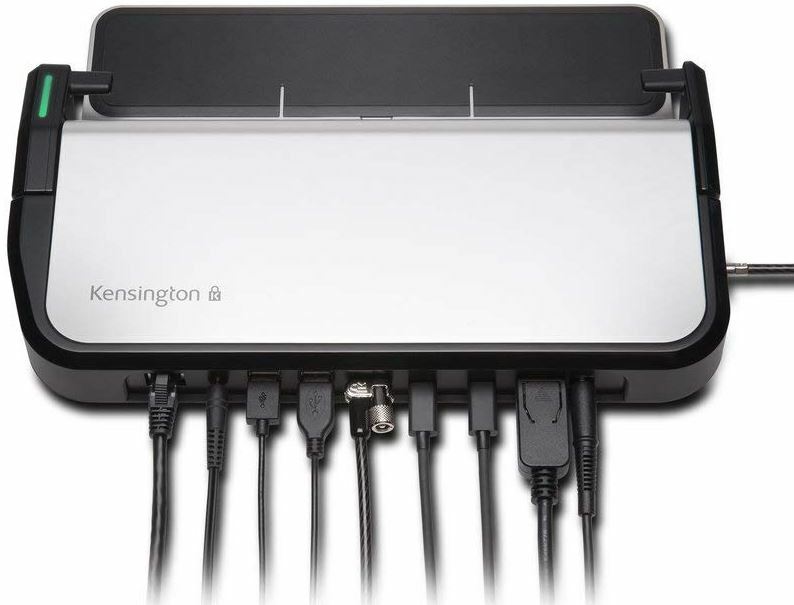 As mentioned earlier, the Kensington LD5400T was made to be suitable for both Mac and Windows operating systems. But its form factor makes it particularly useful for the MacBook Pro, MacBook Air, and similarly sized machines. It’s worth keeping in mind that if you plan on taking advantage of Thunderbolt 3, then your devices have to be enabled for Thunderbolt 3. It’s also worth remembering this format is not backwards compatible with Thunderbolt 1 or Thunderbolt 2, which puts some restrictions on using some older legacy devices. Moreover, Windows users should ensure their laptop or tablet supports delivery of power through these ports before trying to use them. Another of the LD5400T’s virtues is that it’s easy to work with. The plug and play design doesn’t require you to install separate drivers for each machine connected to the port, or anything intrusive like that. There isn’t even a setup process apart from plugging in your stuff. Kensington includes a three-year warranty with the LD5400T. That’s a reasonably lengthy warranty. It’s probably worth taking notice of because these types of docking stations are made from mechanical parts, which are prone to wear and tear when some kind of manufacturer’s mistake was made. Who Should Choose the Kensington LD5400T Thunderbolt 3 Dock? 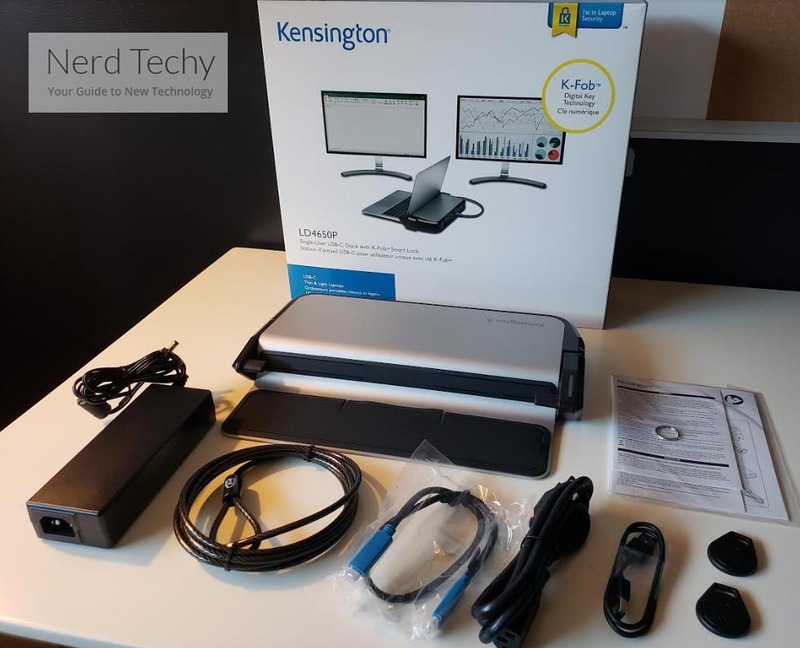 The Kensington LD5400T Thunderbolt 3 Dock is widely compatible with a variety of different types of PC. It’s somewhat limited in relation to the size of laptops you can connect. But that’s a pretty minor limitation that won’t actually end up affecting many people who are trying to use a docking station like the LD5400T. With respect to security, Kensington is one of the biggest names in the industry. Countless other big brands rely on Kensington locking mechanisms for their own products. So it’s no surprise that the locks on their docking station are pretty good. Likewise, the rest of its physical construction was made to last, which is somewhat reflected in the warranty. It’s a bummer that you have to go out of your way to purchase a separate Kensington lock to access all of the potential of this kit. But if you don’t actually need to double and triple lock your stuff, you won’t have to take that step. In any case, for someone who needs to take advantage of Thunderbolt 3 and its exceptionally strong UHD support, the LD5400T is probably worth picking up.